The Red Sea has some of the best diving in the world. It is part of the Great Rift Valley: a trough running from Israel to some degrees south of the equator. This immense crack in the Earth's surface makes for an extremely deep sea, reaching nearly 3000 m. It also explains small islands like the Brothers dive site. Steep-sided and far from land, they were probably thrown up by volcanic actions as the rift opened. The average water temperature ranges from a low of 20oC in February to 31 oC in September in the far south. The winds are often weakest during full moon. The best time to dive the Red Sea? Low season is December to February because of the cooler water, and June to August because of the heat, which makes for quieter dive sites. In the winter months you are also more likely to see Oceanic White Tip sharks in Egypt and hammerhead sharks in Sudan. Likewise for the Djibouti whale sharks when the best time to go is from November to January. Warmer water in summer lures the hammerhead sharks further north into Egypt. September to November is the time to see manta rays in Sudan, and thresher sharks in both Sudan and Egypt. Red Sea Liveaboards - Compare prices online. Book now & pay later. Currents in the Red Sea are normally, like the wind, from north to south. But there are many exceptions to this. 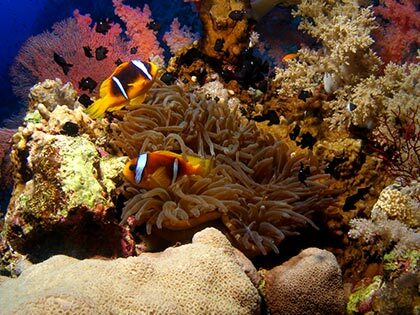 With over 1000 species of fish and 150 species of coral, the Red Sea is rich in life. 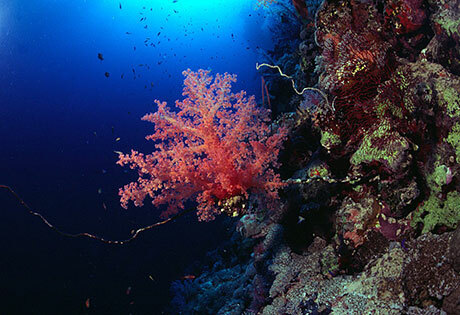 As the Red Sea has few storms, her corals are intricate and beautiful. They are also resistant to bleaching. Turtles are common, as are sharks if you take a southern liveaboard. Egypt | Djibouti | Jordan | Saudi Arabia | Sudan | Israel | Eritrea. 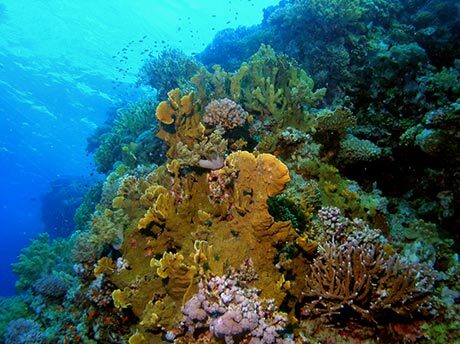 Egypt is a popular diving area with good reason: it has some beautiful dives. You will need to buy a $25 tourist visa when you arrive. If you have no dollars you can pay 25 Euros or 25 pounds. The Egyptian parliament though want to raise the entry fee to $60. The countries revenue from tourism in 2016 was $3.4 billion, a massive decrease from the $11 billion generated by the sector in 2010. Flights from some countries are still not going to Sharm El Sheikh. Flights to Hurghada and Marsa Alam are still operating, although Russia has ceased all flights to Egypt. Make sure you have comprehensive travel and medical insurance before travelling. The British Foreign Office has up-to-date security information about the Red Sea. How much to tip in Egypt? Egypt has a culture of tipping. Tip everybody unless you receive bad service. If you have no Egyptian pounds you can tip in Euros, dollars or pounds. As a rough guide, per person, tip as follows. Restaurants outside your hotel - service charge is often added but this doesn't go to the staff: tip the waiters as well. When tipping do so discretely, fold in the palm of the hand and pass across for example. Don't be surprised if an Egyptian asks you to convert a number of coins to a bank note. The banks will only exchange notes and so people need a friendly tourist to change their foreign tips for them. Find deals on Egypt liveaboards. Book now & pay later. 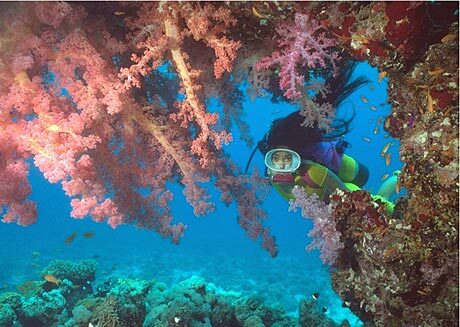 The fledgling diving tourist industry in Saudi Arabia has been curtailed by the impossibility of getting a tourist visa. Diving is still available for foreign workers and Saudi nationals. Diver in Saudi Arabia. Photo credit: Captain Victor Organ. 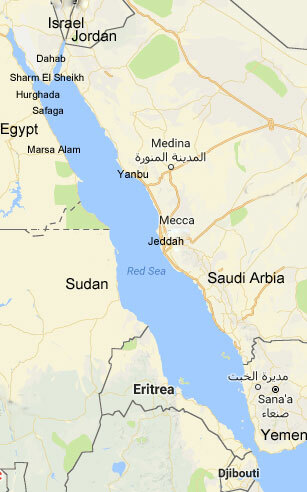 The main diving areas are around Jeddah and Yanbu. There are also some good reefs south of Jeddah. Some of the shore dives in Jeddah have been heavily spear fished (even though spear fishing is banned) and there are also problems with coastal developments polluting the water in some areas. However there are many more fantastic dives, full of life, and numerous wrecks. The best diving is via liveaboard. Whale sharks visit Farasan Banks from March to June. You need to bring along a passport, Igama or Saudi ID and your Saudi Dive Permit. The top hotels in Jeddah have contacts with the dive shops and can arrange instruction for beginners and recreational dives for qualified divers. Many offer private beaches from which to shore dive. Djibouti is at the foot of the Red Sea. It is famous for whale sharks. You dive Djibouti from a liveaboard. Jordan is at the north end of the Red Sea. It has a Red Sea coastline of just 15 miles. The coral is in good condition and you will often see turtles and napoleon wrasse. It's not the place to go to see sharks though. Most of the dives can be done as shore dives. 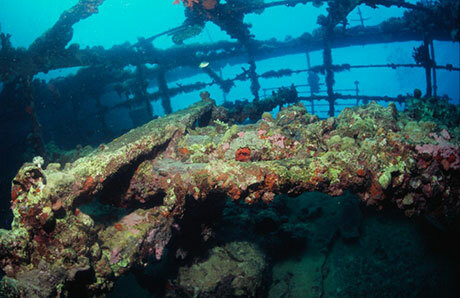 Sudan's most famous dive site is the wreck of the Umbria. This huge shipwreck is a spooky castle of a dive, covered by corals and loaded with 36000 aircraft bombs, cars and wine bottles. Manta rays, whale sharks and, at night, tiger sharks visit. You'll probably be alone on the wreck due to the small numbers of divers visiting the country. Another great Sudan dive site is Sha'ab Rumi South with its awe-inspiring hammerhead sharks. Israel's Red Sea diving is around Eilat. Highlights include Moses Rock and the wreck of the Satil. The diving is shore diving. Eritrea is very little dived. One of its best dive areas is the Dahlak Islands. "Outstanding visibility, crowded with fish and bold coral formations, and NO PEOPLE!" If you want to be notified of updates to the site, along with other diving news and discussion, please subscribe to our newsletter.